New RVs are perfect for buyers searching for the latest amenities and luxuries that make living on the road easier and more comfortable. Over the past 20 years, interior styles, floorplans and construction methods have changed drastically, and you’ll find major differences between an 80’s/90’s/00’s used RV and the newer RV models that are loaded with the latest innovations and breakthrough technology. While more expensive, New RVs offer you the highest quality of living and you’ll feel right at home on the road, no matter where you are! 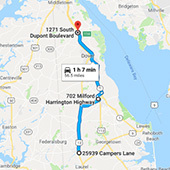 At Delmarva RV Center, we host a wide variety of New RVs for Sale in Milford, Delaware, Seaford, Delaware, and Smyrna, Delaware. Our inventory consists of over 300 RVs including New Class A Motorhomes, New Class C Motorhomes, New Fifth Wheels, New Toy Haulers, New Travel Trailers, New Park Models and New Expandable Trailers from the biggest brands in the industry including New Coachmen RVs, New Forest River RVs, New Grand Design RVs, New Jayco RVs, New Keystone RVs, New Dutchmen RVs and much more. Take a look at our inventory below and if you have any questions give us a call or fill out the form on our contact page!